May 25 2017 – The Atlantic begins on June 1 and ends November 30. This year has been a little unusual with the first storm, Arlene, named in April. That was a tropical storm in the north central Atlantic that had no impact on land. It also should have no indication on the season ahead, but the element that might have played a role in lowering activity seems to be a non factor. 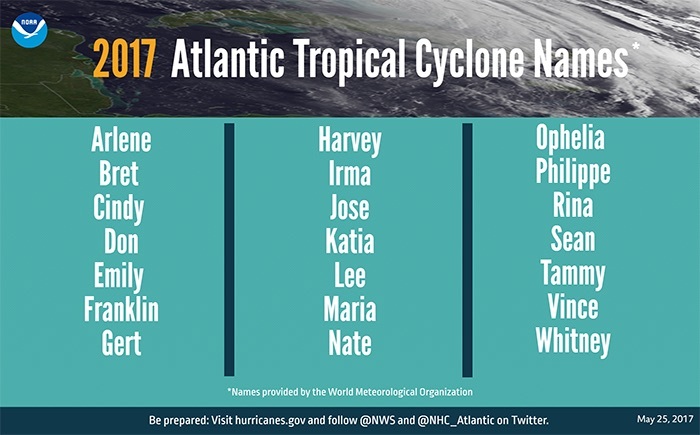 The complete list of names for Atlantic storms this season is below. The short version of tropical season for the Atlantic can easily point to a connection with the Pacific Ocean. An El Nino, or warming of the equatorial waters in the Pacific tend to increase upper level winds and decrease storm growth in the Atlantic. It appears the signal that a new El Nino might be forming will not develop after all. With that in mind, already above normal warm ocean waters in the Atlantic (Sea Surface Temperature Anomalies) the expectation for a busy year is upon us. 2016 had 15 named storms, and was the most active since 2012. The last major hurricane to hit the US was Wilma on Oct. 24, 2005. This is the longest stretch in recorded history without a landfall of a Category 3 or higher. 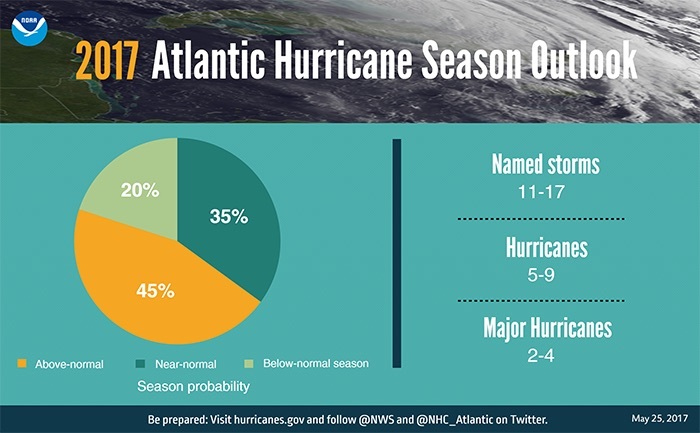 NOAA is predicting an above average season of for the Atlantic. However the well respected Colorado State University (the home of where Dr. Gray and Dr. Landsea developed their long range forecasting technique, a benchmark for for teleconnections in seasonal forecasting) is contrasting this with a lower forecast. See the comparison below.